The port areas of PORT OF KIEL are separated into the city ports, the Ostuferhafen, the canal ports and Kiel Airport. 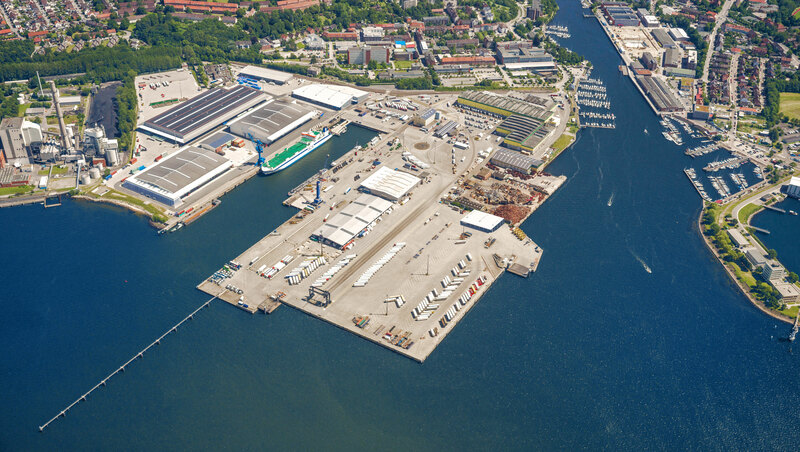 the largest coherent port area is located on the east bank of the Kiel Fjord. This is where the ferry lines to North Sweden, Russia and the Baltic States are concentrated. The skyline of the city port is shaped by the ferries to Scandinavia and the cruise ships. Our Nord- and Scheerhafen as well as Kiel Airport are located on the Kiel Canal. The terminal Schwedenkai is sign-posted on all main routes. Follow the signs "Fähre" and then "Schwedenkai" or "Fähre Göteborg" (ferry Gothenburg). On foot: You'll get from the station or the city centre to the Schwedenkai within 10 minutes. The terminal Norwegenkai is sign-posted on all main routes. Follow the signs "Fähre" and then "Norwegenkai" or "Fähre Oslo" (ferry Oslo). On foot: You'll get from the station or the city centre to the Norwegenkai within a couple of minutes crossing the pedestrian bridge "Hörnbrücke". The Ostuferhafen is sign-posted on all mainroutes. Follow the signs "Fähre", "Ostufer" and then "Ostuferhafen". On foot: The Ostuferhafen is quite far away from the city centre and therefore quite difficult to reach on foot. You can take a taxi at the station or in the city centre resp. take the bus 11 and 60S leaving from the main station to Dietrichsdorf. Get off at the stop "Grenzstraße". The terminal Ostseekai is sign-posted on all main routes. Follow the signs "Fähre" and then "Ostseekai". On foot: From the station as well as the city centre, you'll reach the Ostseekai within 10-15 minutes. You will pass the terminal Schwedenkai on the way. Another option is walking along the pedestrian zone. To get to Nordhafen and Scheerhafen follow at first the signs "Universität" on B76 and later "Nord-Ostsee-Kanal" (Kiel Canal) respectively "Nordhafen"
On foot: The canal ports Scheerhafen and Nordhafen are difficult to reach on foot due to their distance to city centre and station. We recommend taking a taxi or public transport to get there. Follow the signs "Fähre" and then "Schwedenkai" or "Fähre Göteborg" (ferry Gothenburg). The Hafenhaus is located at the entry to Schwedenkai. On foot: From the station or the city centre you'll reach the Hafenhaus within a few minutes.